Heather brings almost 25 years of beadmaking experience to The Crystal Forge. She will share her heat control magic and tricks to give your work a clean, sharp look. She will reveal her secrets to applying glass to a large mandrel while maintaining strict control and precision. Students will start with an 1/8” mandrels then work their way up to……let’s see how brave you are; maybe all the way up to a 1” mandrel! TWISTS! Almost all of Heather’s beads contain TWISTS! She will demonstrate numerous different ways to layer the glass to create new looks to your twists. Learn to control the application of your twist and match the ends when you apply your twist…your friends will be amazed! Ah, but your beads is not complete until the cold working is done. The holes of your large hole beads need to be polished. 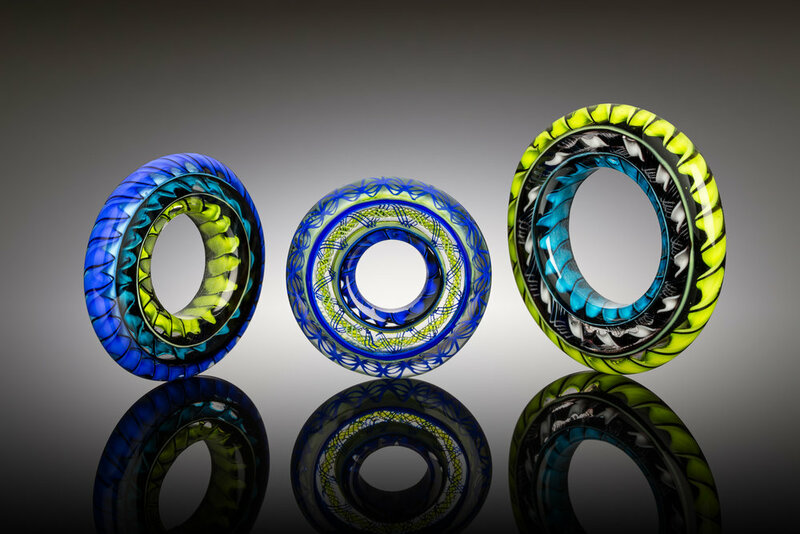 Heather will demonstrate polishing the flat surface of her disk bead; one more way to make your work look crisp! She will also bring her tools for you to try and will instruct you on how to use them. I’ve never been to Germany so I’m quite excited! I have heard wonderful things about GLAS Gestaltung studio and Audrey! I plan to check out the bead show in Werthein and visit Lauscha too. Note: Class are currently full. Contact the studio to be put on the Wait List. I will have beads, tools and jewelry available for sale at the bazaar. I'll also be happy to chat about the process of making the commemorative bead.